Since 2002, the Lord has opened international doors for PFC to take prison ministry resources abroad. PFC facilitates this by partnering with Foreign Nationals in countries such as: Russia, Kenya, Burundi, Congo, India, Nepal, and many more. Prisoners For Christ has grown leaps and bounds on the international front. Since our first trip to Russia in 2005, we have traversed the globe and established over twenty-five current field ministries in countries all around the world. While training dozens of American PFC volunteers over the years, PFC’s Founder and President Greg Von Tobel noticed the lack of cohesive, exhaustive “how to” videos on preparing for a missions trip. So he has created a video series for the PFC YouTube site that covers all of the ins and outs of traveling abroad for ministry. 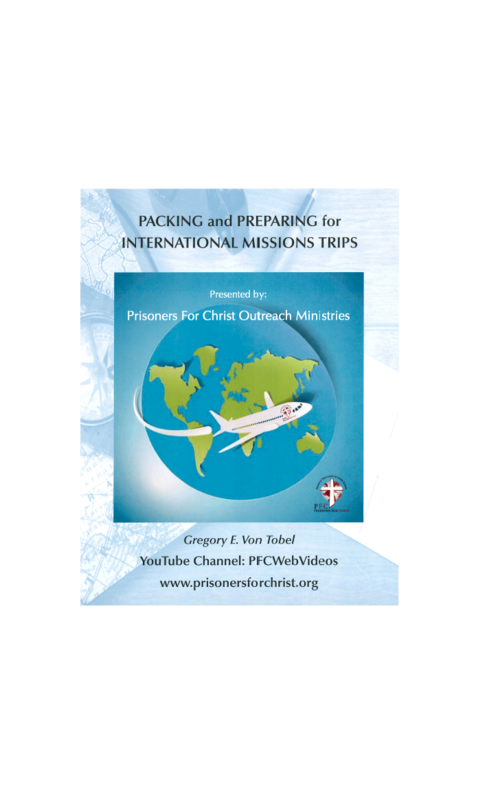 Perfect for any person, leader or lay, to learn or teach about packing and preparing for international missions trips. Share it if you know someone who could use this informative tool! Dr. Robert F. Jordan is PFC’s Chairman of the Board, an International Group Leader, and oftentimes “journalist” for teams. Bob’s journal reports are always full of narrative adventure as well as boring (but essential) statistics. Click Here to download and read Dr. Bob’s latest missions journal for the maiden trip to Madagascar! Mike North is PFC’s Vice President of Communications. Mike took his first prison missions trip with PFC in 2013 to Kenya. Mike created a blog site which included journal entries, photos, videos, etc. for his family, friends, and donors. Click Here to visit Mike’s blog site.